CONTEST CLOSED - Winner is Michele - Congrats to you!! One word - HEALTHY. I have used VCO as a health food before. 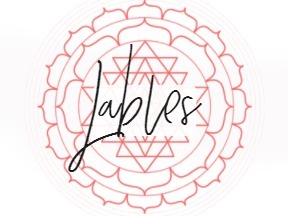 When I got the opportunity to work with Tropical Traditions, my Mom told me to jump on it - that this brand is known as the best. * I eat it by the spoonful. I leave it out and several times throughout the day, I pop a spoonful in my mouth and let it melt. The flavor of Tropical Traditions is the best of any brand of VCO I've tried. *Facial moisturizer-After my shower I slather it over my face for soft supple skin. No toxic chemicals, food grade - no worries. Great skin. * Hair/scalp treatment- About once a month I comb it in roots to ends wrap my head in a hot towel and leave it on for a half hour or so. I love it for winter time dry scalp. * Add it to smoothies & hot tea-Those are great ways to get Ju to ingest it. He won't do a spoonful. * Pets - I give a dollop to my dog & cat. They both love it . I use it as an overall heath tonic. With my sample of VCO, I received a book that is a wonderful resource for all things Virgin Coconut Oil. Filled with uses,testimonials & recipes it will start you off right in your introduction to VCO. If you've already used it, it will further educate you. I highly recommend this product. I am a firm believer in replacing not so healthy with healthy - building. Even if not for a specific reason. Adding healthful things to your life helps your body become a strong foundation. A strong foundation can weather illness & age, much better than a weak one. One lucky reader will receive a 32 oz jar of Tropical Traditions Gold Label Virgin Coconut Oil & a copy of the helpful book "Virgin Coconut Oil - How It Has Changed People's Lives and How It Can Change Yours". MAIN ENTRY: Visit Tropical Traditions and tell me something that you found to be interesting about their VCO. Something interesting about their VCO is it's completely organic! Will cooking with Coconut Oil cause it to become hydrogenated and toxic like hydrogenated oils? No. Hydrogenation is an industrial process where hydrogen molecules are introduced to the oil to make it solid at room temperatures. It chemically alters the oil and creates harmful trans fatty acids. Cooking with coconut oil does NOT introduce hydrogen into the oil or hydrogenate it. Coconut oil can be used as a replacement for butter or margarine and as a substitute for cooking oil. Tink of the yummy flavor combos! Very interesting website. I learned that you can take the VCO and use it in place of butter in your recipes! I love using coconut oil! I thought it was interesting that they recommended combining it with palm oil for increasing the smoke point. But what is the smoke point? And should I be combining it with some other oil when baking (at say 400F)? Their oil is Organic! Yay. I can only imagine how yummy some foods would taste when cooked with this! I didn't know you can use it in place of butter! I love all of the things you can do with it! I also love that it's safe and organic. I learned that Coconut oil is liquid above 75 degrees F. (25 C.), and below that it will be a solid fat. It can be stored in either form, and it can be liquefied easily by applying low level heat. I learned that the coconuts they use are fresh and do not need to be refined like other brands! they are organic too! Purely organic, good for skin, good for hair and good for garnishing salads. Love it! May Canadians enter? I found it interesting that refrigerating or freezing coconut oil changes its flavour. I learned that you do not need to refridgerate the oil but it should be stored away from direct light. It also has a shelf life of 18 months but usually will last longer. Wow, I am so interested to try this. We have been considering going raw and I have read that it is important for raw kids to eat Coconut Oil. I learned that "Some people buy natural peanut butter, pour off the excess oil at the top, and mix in coconut oil in its place"
I use coconut oil in my hair and it has been better since. But I was unaware that it is a better for you item than butter in recipes. I learned that...."Since it is a stable cooking oil, one can simply replace unhealthy oils in their diet with coconut oil." Totally amazing. I did not know all of this about Coconut oil! Thanks! I"m following your blog via email!! THanks! 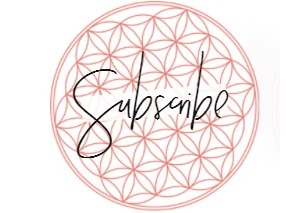 I'm now following you on twitter - i'm susieqtpie and I just tweeted the Tropical Traditions Giveaway!! How fun! 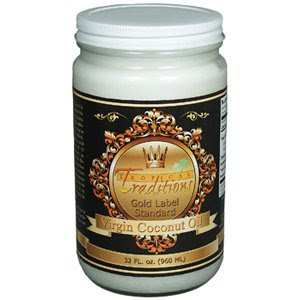 Tropical Traditions Green Label Virgin Coconut Oil is a high quality machine-made Virgin Coconut Oil. Certified organic fresh coconuts are first dried and then the oil is cold-pressed out by machine. A recipe calling for butter, margarine, or any other oil can be substituted for coconut oil, and it can be used as a spread on bread or biscuits and used in coffee and tea. And I would love to try this. That Coconut oil is not a source of Omega 3 fatty acids. I had no idea that vco's, "do not need further refining as their natural antioxidant properties make them very stable oils." I entered the tiny soles giveaway. I thought it was really interesting that they have to use coconuts within 24 hours of harvesting. This product sounds great. Thanks for the chance. I didn't know that you could use it in so many recipes; smoothies and in coffee and tea. 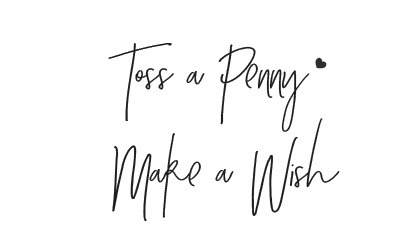 I subscribe to Wishing Penny. I never new that there were so many diverse uses for cocnut oil. I like the fact that it's useable for the diabetics, as my husband is insulin dependant, and stuggles with the disease. I would love to try this. I've just been reading about how great coconut oil is for you and here's a giveaway for it. Yay! I learned that the expiration dates on the Virgin Coconut Oils are for two years. I learned that coconut oil is NOT destroyed or changed chemically in anyway from its original form by using low heat unlike other plant oils. Once a person is used to taking coconut oil, the amount recommended per day is 3.5tbsp along with food high in fiber and protein since the VOC is usually found in the coconut meat. Thanks! I would love to try this product. It sounds great, I had never heard of it before Virgin Coconut Oil. I learned that an adult should have 3.5 teaspoons of VCO per day, but that someone who is just starting to use the Coconut Oil should not start out with that much per day but build up to it. Thanks for the giveaway, and for the wonderful information about this product. I like the information about using it during pregnancy and lactating. Sound great. I really had no idea that you could freeze it and it would alter the taste into a white chocolate like flavor. I love white chocolate!